The Catalan architect, key figure of modernism and one of the pioneers of the avant-garde of the twentieth century, is hit by a tram.Lying on the sidewalk, his unkempt appearance condemns him. He died three days later. Barcelona, June 7, five past six p.m.. Antoni Gaudí i Cornet is about to cross the Gran Via de les Corts Catalanes at the intersection between the streets Girona and Bailén. Leaning on his cane with rubber pad, delivered to their artistic dreams, cross the street slowly. A tram which runs from line 30 runs over him. The artist receives a terrible impact on the ribs and temple. Critically injured, he is lying on the ground unconscious. His worn clothes, fastened with safety pins instead of buttons and dusty shoes that cover their wrapped in strips of cloth feet, give a poor appearance. Most passersby, taking him for a beggar because of his unkempt appearance, denied their help. Only two of them are offered to assist him: Antonio Roig, managing the port, and Antonio Noria. They are trying unsuccessfully to arrest four taxis; the first three refuse to transport the wounded, fearful that the blood staining the upholstery of their vehicles. The fourth not even stop to see the body lying on the sidewalk. A policeman approaches the tumult surrounding the artist and imposing his authority, requires a taxi to take him. To ensure that it will be properly cared for, he rises to the vehicle. The officer ordered the old man to move to the nearby dispensary Round San Pedro, 37. The logbook will record center cursory examination of the wounded: ‘trauma at the height of the right ear and commotion of the patient, who calls himself Antonio Gaudi … It seems that the artist is appreciated regained lucidity for a brief moment, long enough to provide their identity, so far unknown data because the artist was undocumented. In their pockets not wearing more than the book of the Gospels, a rosary, a handkerchief and the little key from his desk. The doctor on duty, to the serious condition of the injured, ordered his transfer to Hospital after administering a spasmodic. Finally the fate wants Gaudí is transferred to the Hospital de la Santa Creu, but it’s too late. The next day is recognized by the chaplain of the Sagrada Familia, Mosen Gil Parés, good friend. Gaudí died three days later, he has 73 years. The coffin covers much of the city. The funeral procession is multitudinous, the chapel is visited by hundreds of locals. The turmoil generated is such that hardly contain urban agglomerations. The authorities prohibit sending crowns, but this does not prevent the florists of the Rambla, the Boqueria vendors and neighbors throw flowers as the coffin. The shops are closed and trams are forced to interrupt their journeys by the crowds that add to duel. The revered architect is buried in the chapel of Carmen, in the first niche of the crypt of the Sagrada Familia, the only part of the temple which was built next to the Nativity facade. Funeral ceremonies are officiated by the most prominent members of the clergy: Gil Pares, and the chaplain of the Güell family, Ricardo Persina. Telegrams of condolence from King Alfonso XIII, the bishops of Mallorca and Avila and the mitred abbot of Montserrat, who granted indulgences to those who perform some act of piety in memory of the deceased are received. The majestic burial bears witness to the prestige that the architect has acquired among his fellow citizens. Known as the hermit of the Sagrada Familia, Gaudí then is a very popular and much-admired character. A man who despite his haggard appearance has managed to earn the respect and affection of his fellow citizens. His masterpiece, the Sagrada Familia, called ‘the cathedral of the poor’, their only vital goal remains unfinished. Since 1915 he had given exclusively to erect forty years working feverishly in the atoning temple, begging to finance its construction even to sleep multiple times in a small cubicle on premises. At his death, its construction is in the hands of architects and artists. Antoni Gaudí, universal architect, fought for his ideals, died as a poor, was buried like a king and has passed into history as one of the cornerstones of modernism and one of the great masters of contemporary architecture. Guell estimated that everything must have happened around 1950 and assumes that Bartali had to go through Barcelona “for a career or as a tourist,” and certainly as a pious man who was visited the temple of Gaudí. “He wanted to work and did live up to their potential and their faith, certainly,” he explains. Bartali, winner of three editions of the Giro d’Italia and Tour two of these separated by ten years (a feat no one has matched), is a legend in Italy. But not only for his sporting achievements, but also for other personal actions that have crossed borders. The next day, in Aix-les-Bains, he won again. On the third day in Lausanne again. Leader Tour lead and practically in his pocket. As explained years later Giulio Andreotti, “say the civil war by a victory in the Tour de France is definitely avoided excessive, but certainly Bartali helped ease tensions.” When Togliatti awoke after surgery on his skull his first words were: “What did Bartali?”. Giorgio Nissim, next to several priests and nuns. Bartali carrying, hidden in the picture of your bike, photos and documents that were used to produce identity cards. He deposited them in convents, where they had a clandestine press. In 2003, following the discovery of these acts of war, his son Andrea said: “My father never talked about what he did in those years. He said only that in life there are things that are done and just “. Even without direct intervention came to save lives. In 1943 Antonio Davitti a guard on the island of Elba, was deported to Dachau. A German officer knew of his Tuscan home and asked him if he knew Bartali. Davitti took from his wallet a photo dedicated cyclist. “Give it to me and prepares a list of twenty prisoners, not regret.” Four days later the elected left the camp to be moved to a factory. They had saved his life. The sporting decline coincided with the glory Bartali and Fausto Coppi, with whom he had epic duels. Coppi Bartali godly against the libertine. Their collaboration to spend a full bottle of water in ascension is a graphic icon of the sport. A late fifties they shared in the RAI television shows. They even sang a duet with ironic tone. Gino “Ed io ripenso to quel lontano / le lotte nostre sui sui monti and piano / e sulle Alpi … coperte of nevi tempo” and tore Fausto replied: “… come perdevi, eat perdevi” (how you lost). In September 2013 Israel Bartali named Righteous among the Nations, a booth who helped Jews during the world war recognition. Antoni Gaudí where he lived? When Antoni Gaudí Reus stopped coming to study architecture in Barcelona he moved with his brother to Old City, particularly in the district of San Pedro, Santa Caterina and La Ribera, in 1868. His family, of humble origin, he sold some land so that their children could study and that area was cheaper than they found it. They were in the Plaza de Moncada number 12 and then moving up close, the street number of the L´Espaseria 10. Both houses next to Santa Maria del Mar, inspired by Gaudi’s architectural background. After lived Verdaguer and Callis street number 16, where an aunt lived and where, just a few years later, they built the Palace of Catalan Music, a symbol of modernist Barcelona. The last of the Old Town is the street where he lived Sant Rafael number 26, on the corner of Rambla del Raval. During his life in Old City, Antoni Gaudí was a young man who dressed well, going to gatherings organized in different bars and was away from the center of religious life. But once started receiving professional commissions, was changing lifestyle and also district. Most of his clients were bourgeois and lived in Barcelona’s Eixample district. Then Gaudí decided to move and did so very close to one of the most famous modernist furniture factories of the time. First he lived on the street Consell de Cent 370, and then moved la Diputació street, 339. Gaudi finally settling in the Casa Rosada Park Guell, a home he shared with his father, who died a year and her niece, who died six years later. When Gaudí was left alone was immersed in the project of the Sagrada Familia and ended up living in the temple workshop atonement until he died. Güell Pavilions built between 1884 and 1887, were the first commission that Gaudí received what would be his great patron, Eusebi Güell’s textile. It is the guard house, horses and riding, located in the entrance area to the Finca Güell Avenida de Pedralbes. “The family was very rich Guell, Gaudi interested him greatly and make a work that satisfied. 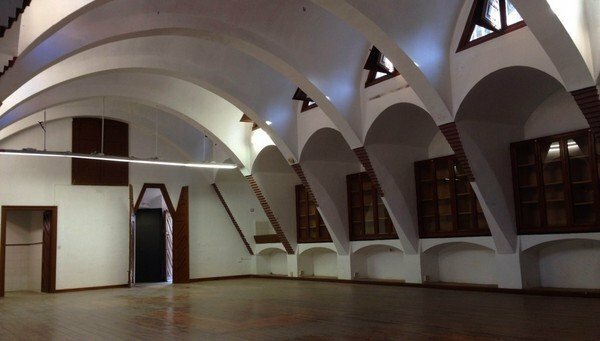 So we find the typical construction commonly used for pictures but the architect went further by making use of the Catalan vaults and arches, “says tour guide Federico Araya. The jewel of the exhibition is inspired by the iron gate poem Atlantis, Verdaguer, where Gaudí forge a mythological dragon garden of the Hesperides. In fact, the entrance is full of symbolism and to discover details such as tree fruits and gold facade scales. The garden is one of the attractions of the place. Considered a national historical monument, hides one of the cranes that were used to build the quarry. The ventilation towers are decorated with mosaic, and this was one of the first times that Gaudí used this technique. Was used to construct buildings, surprisingly, bricks, a material very cheap considering purchasing power Güell, but allowed him to play with the forms and be more creative. 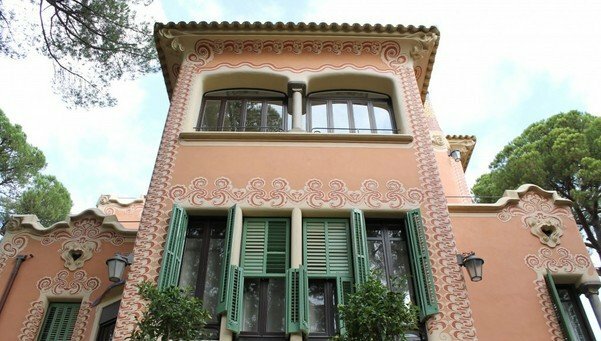 Until now you could only access the Güell Pavilions, located at number 7 Avenue Pedralbes through a guided tour during the weekend. From January 2nd can enter every day of the year, except for special holidays, 10:00 am to 16:00h The entrance fee for adults is 4 euros, a 50% discount for students under 18 and people over 65. From 0 to 6 years admission is free.